Register a new domain or transfer your existing ones now! In addition to offering the most commonly registered top level domain (TLD) options, EziWeb offers many of additional TLD options bound to fit your needs! EziWeb is acredited with ZACR (ZA Central Registry) since 2014. Searching for that perfect domain? Catch your ideal domain names with the domain searcher! Use the dropdown to select the extension you would like to search. Why buy domains from EziWeb? Country specific TLDs are an excellent way to communicate that your site has content targeted for a specific region or market. EziWeb is proudly South African and as such specialise on local TLD's. We aim to provide you with reasonable prices and excellent service. Your domain privacy is our top priority. We protect your personal information and reduce spam with our free Whois/ID protection. EziWeb is accredited with ZACR. EziWeb is a trusted domain provider with the highest quality guarantee level and dedicated in-house support. Our South African based cloud servers utilise the latest technology, giving you fast, reliable speed and uptime for you domain and website! EziWeb has many more TLD's available. When you search a domain name, more options will be offered. We’ve compiled a list of frequently asked questions to help you understand Domains, protecting your ID, Domain Safety and our other services, better. A domain name like www.mydomainname.co.za is a website address that people will use to find you on the internet. Domain names are used as an address to locate businesses, organizations, or other entities on the Internet. 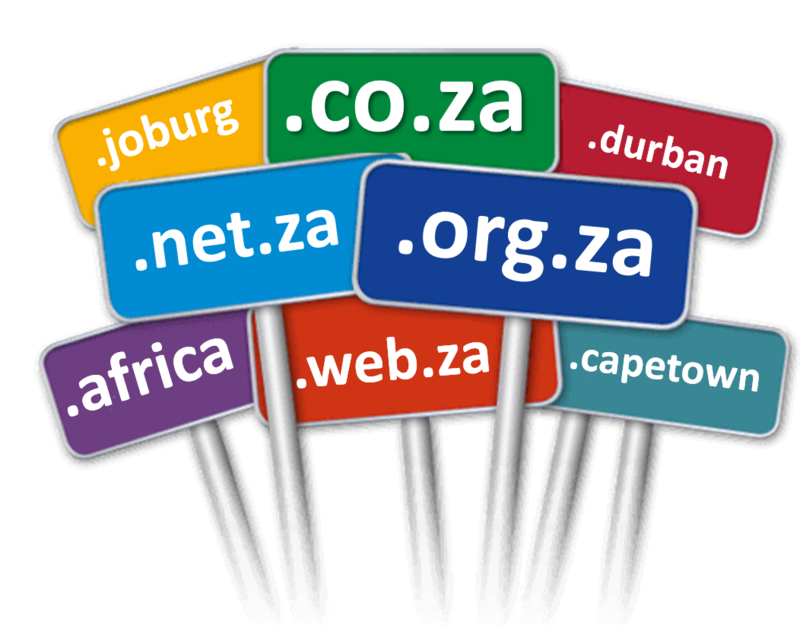 The domain name is the foundation of your website (www.mydomainname.co.za) as well as your email address (contactme@mydomainname.co.za), using a well thought up domain name allows your customers to identify and remember you more easily on the Web. A great benefit of using your own domain name is that regardless of how many times you change your website hosting provider, your Email and website address will always remain the same. TLDs (Top Level Domains) are technically the last suffix of a URL address, e.g. www.mydomainname.com or www.mydomainname.co.za. In the first instance the TLD is "com" and in the second it is "za" representing a country code, "za" being South Africa's country code TLD. Finding a domain name that's easy to type is critical to online success. Keep it short. Use keywords. Target your area. Avoid numbers and hyphens. Be memorable. Research it. The ultimate purpose of your website is perhaps the most important thing to consider. If you’re running an online business, then depending on your market, you willl find a .com for the international market, .africa if your products/services are Africa focused. If South Africa is your market the .co.za should be fine or you may want to localise it even more to your city, e.g. .joburg. If the website is for an organisation or faith-based, then you have .org.za or .faith extensions as viable options. This depends on the ccTLD or gTLD that is being transferred. Local or geographical TLD's can be transferred in a matter of minutes, provided the domain transfer is accepted by the domain owner.